The lymphatic system acts as a filter that runs throughout the body and carries fluid and cells, no blood. Lymph nodes are small raisin-sized structures that are found in the lymphatic system throughout our bodies in specific areas. They serve as checkpoints in the body where immune cells help fight infections and cancer so that it doesn’t spread throughout the whole entire body. The armpit and groin areas are two of the largest clusters of lymph nodes in our body. Each of these lymph node basins usually houses around 20-30 individual lymph nodes. The lymph nodes in the underarm (the axillary lymph nodes) are the first place breast cancer is likely to spread and so they are examined in every breast cancer patient. 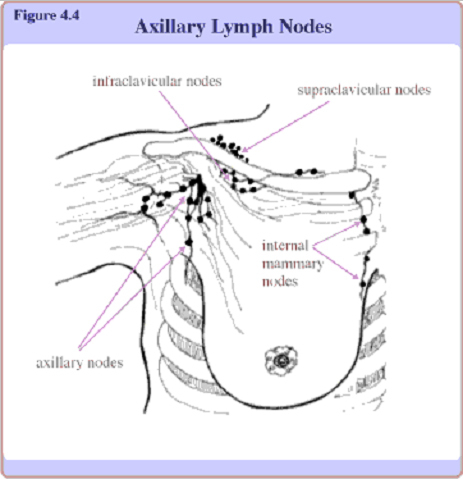 Figure 4.4 shows the location of the axillary lymph nodes. Lymph node status is highly related to prognosis and is used in the staging of breast cancer. Lymph node-negative means the axillary lymph nodes do not contain cancer where lymph node-positive means the axillary lymph nodes do contain cancer. Obviously, cancer that is found only in the breast (lymph node-negative) has the best prognosis versus a poorer prognosis seen when the cancer has already spread to the lymph nodes (lymph node-positive). Along the same continuum, the more nodes that are actually affected, the poorer the prognosis as well. During a physical exam, a health care provider feels under the arm to check if lymph nodes are enlarged. If no nodes are felt, it is generally a good sign that the cancer has not spread however this is not 100%. Cancers that have spread early may not enlarge the lymph node so that it is actually palpable to either the patient or her doctor. If a node is felt on exam or visible on mammogram, ultrasound, or MRI, it can be further evaluated with a fine needle aspiration (FNA). This will usually be performed before surgery in order to help stage the breast cancer. Fine needle aspiration is a type of biopsy procedure where a thin needle is inserted into a suspicious lymph node. As with other types of biopsies, the sample collected during fine needle aspiration is sent off to the pathologist for microscopic evaluation. Positive results for cancer in the lymph node is prognostic for cancer spread outside of the breast itself. However, negative results do not predict with 100% certainty that the lymph node is negative for disease. The needle will only sample a small portion of the lymph node and the needle may or may not sample that cancer-affected area. Think of sticking a grape with a needle, you may or may not hit a seed. The more definitive biopsy for staging breast cancer is the sentinel lymph node biopsy where the entire node is sent off for evaluation at the time of the mastectomy or lumpectomy (See “What is a sentinel node” section). Fine needle aspiration is generally considered a safe procedure and complications are infrequent. « What do my Biopsy results mean? » Who’s on my Team?